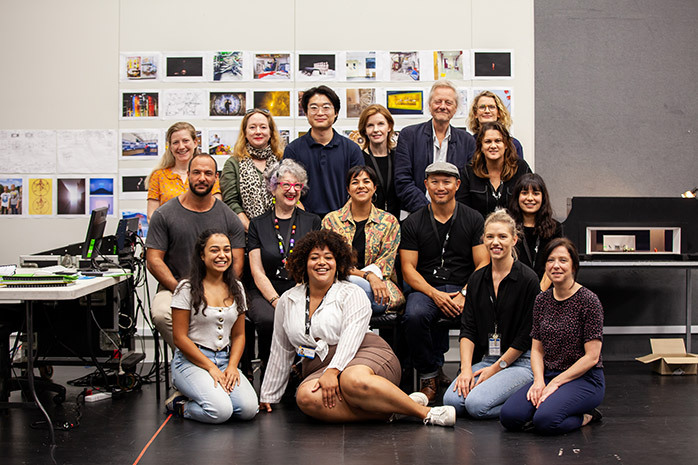 The CAAP Directors Initiative is aimed at unearthing, nurturing and developing Asian Australian directors for the stage. Working with Contemporary Asian Australian Performance (CAAP), in partnership with Queensland Theatre and Melbourne Theatre Company, Sydney Theatre Company offers a two-year training program for its participants, currently Kenneth Moraleda, Tasnim Hossain, Courtney Stewart and Jennifer Rani. Jordan: How did you first become involved with the CAAP program? 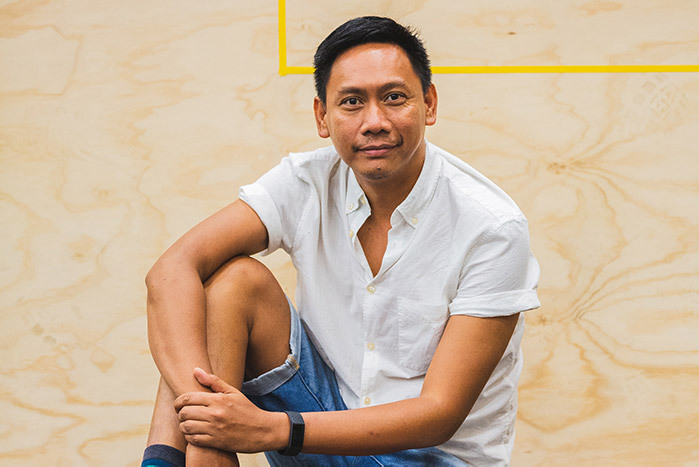 Kenneth: CAAP had a playwriting program called the Lotus program [in collaboration with Playwriting Australia], which aimed to put more diverse stories on our stages, and I was facilitating the introductory workshops for this. I then joined the intermediate course, where they mentored us and held workshop sessions over a period of eight months, then, after an application process, four playwrights, myself included, were selected for the final stage, mentored by Tommy Murphy. From that playwriting program I heard about the development of the CAAP directing initiative. It made sense: with more Asian-Australian playwrights on their way to writing new work, now we need more Asian-Australian directors. Working with [STC Associate Director] Paige Rattray, once again I helped facilitate the initial workshops, this time for the directing initiative. From that, four successful applicants were taken through to the next stage: Tasnim Hossain, Courtney Stewart, Jennifer Rani and myself. It’s like an internship in a sense but, because it’s a pilot program, we also got some say in what we wanted to get from it. A lot us are performers in the group. I acted for Sydney Theatre Company in several plays recently [Kenneth performed in Talk, Australian Graffiti, Rough Draft: Barbaric Truth and Muriel’s Wedding ­the Musical in 2017], so I’ve always known how the company works from an actor’s point of view, but never from a directing standpoint. So we asked about the things within the company that were mysterious to us as performers: those design meetings that we never got to go to, how plays are programmed, and the criteria for selecting them. We gave STC a wish list of things we wanted to learn about, and this year with CAAP we’ve sort of made it happen. So you’re getting almost everything on your wish list? Yes, over the last few months we’ve been speaking to most of the heads of the departments in the company: design, dramaturgy and playwriting, production and marketing. All the people we’ve spoken to have had amazing information; incredible, useful information for us to learn and learn from, to start our path in directing. When you did the initial playwriting workshop, did you know then you wanted to explore directing too? Yes! I did write a play at the end of that process, but speaking to Annette [Shun Wah, the director of CAAP], whom we call our fairy godmother because she is absolutely brilliant at ensuring we get fair representation in Australia, she said, “I have a feeling you have the capacity to direct – do that”. Cast and creatives on the first day of How to Rule the World rehearsals. Kenneth front, centre. Is that how you’re feeling now, after working as Assistant Director on How to Rule the World? Well that’s another fantastic thing: we thought this was just an opportunity to observe the plays, to sit in the room and watch the whole process. But each of us has been given a play to assistant direct, apart from Courtney who is acting as dramaturg for one of the plays this season. I was Assistant Director for How to Rule the World, and I also sat through a couple of the workshops before we came to rehearsals. 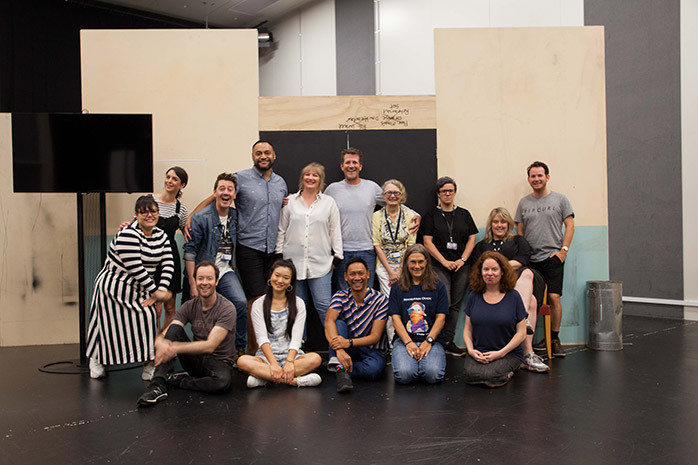 It was very interesting to see the development of a new Australian work, the changes that have to be made, and all of that forward thinking before we even hit the rehearsal room floor. Then during rehearsals it’s a bit of an otherworldly sensation to not be on the acting side. It’s a really good shift of focus! You have separate placements on plays throughout the season, but to what extent do you have the opportunity of working and learning alongside the other members of the initiative, Jennifer, Courtney and Tasnim? Yes it’s something we have decided to keep in place – working together and using each other as a support structure – so we’ve had some meetings outside of the schedule here, and we are planning something to bring these newfound skills and freshly honed previous skills to fruition. It’s nothing we can publicise yet, but having had access to the resources and people of STC has encouraged us to be more proactive. It doesn’t seem so impossible to get a show up, or to plan for bigger and better things. 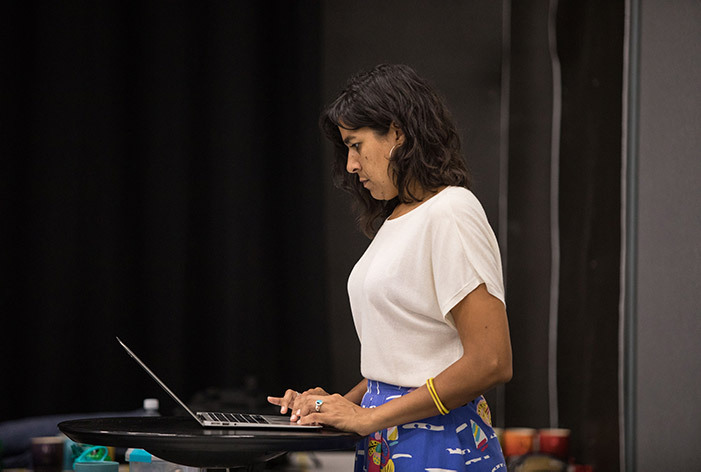 It feels that in the last few years, thanks to programs like CAAP, steps have been taken to address the cultural homogeny of Australian theatre-makers. How far do you feel we’ve come? And how much further do we need to go to make sure that our stages are representing everyone in Australia? I’ve been in the industry for a long time. I graduated from NIDA in 1995 and I would go to auditions with the same four actors in my age group that are male and Asian, so representation was very low on television, in film and in theatre. It is through our fairy godmother championing the cause that this enormous ball started rolling. There’s definitely a need for it, and people are now feeling that vibe, understanding that we need to see this diversity. So there have been some really good leaps forward in this aspect. You and your fairy godmother have been doing good work. Yes she’s busy, because this program is in collaboration with the other theatre companies as well, in Melbourne and Queensland. Overall it’s been really good. It’s not necessarily these companies teaching us, it’s about us being given the opportunity to grow and expand, so the thinking is slightly different than a direct mentorship. The companies show us how theatre works on all levels, and get input from us about the kind of theatre we want to make, as artistic practitioners and also people of our culture, I suppose. It’s a good dialogue happening at the moment between the company and CAAP directors. Jennifer: As an arts worker, I’ve been all over the place. I’ve opened and run a cafe, I was in the army, I studied at the University of Tasmania, moved to England where I did some acting training at the Royal Academy of Dramatic Art and worked as an Events Coordinator for a film festival. I moved back to Australia and worked for the Museum of Old and New Art as an events producer, and it was back then that I began exploring the balance between my project management abilities and my artistic experiences. In 2014 I was lucky enough to receive an Emerging Cultural Leadership grant from the Australia Council and that brought me to Sydney, which felt like the epicentre of theatre. I didn’t have a project in place when I arrived, so I made a wish-list of theatre-makers I thought I needed to meet. I contacted dozens of people and they all gave me some time. I took an Artistic Associate position with the Tamarama Rock Surfers, joined the team behind the WITS Festival Fatale, worked in administration for Arts on Tour, did some acting for television and some play-readings for Apocalypse Theatre. I was trying to work out how to get a foot in the door in any capacity. [During my internship with Playwriting Australia] I developed a professional relationship with Iain Sinclair that led to an assistant director role on his production of Of Mice and Men for Sport For Jove. It was at this time that I reached out to [STC Associate Director] Paige Rattray. It must have been encouraging for an out-of-towner to arrive and throw out all those feelers and to be met, for the most part, with such positive responses. Yes, I feel encouraged that there is a way for anybody to work out what it is they want to do. I had a sense, even back then, that Sydney is open to people like me. People have been so encouraging. I was asking all these people to tell me about their jobs and their workplaces, and eventually the Tetris puzzle of possibilities settled into my brain and I developed a firmer idea of the areas wanted to head towards. You were offered a place as one of four CAAP directors at STC. Tell me about your involvement with the two-year training program. I’d heard about CAAP’s activities and gone along to a couple of seminars and I was really interested in what they were doing in association with STC. As a performer/creative from a diverse background I felt a strong desire to create work with the Asian community – not an opportunity I’d had in Tasmania. So I applied for the CAAP program and to my great surprise, I got in. Cast and creatives on the first day of rehearsals for Mosquitoes. Jennifer centre. So your involvement with CAAP landed you the job as Jessica Arthur’s Assistant Director for the upcoming STC production of Lucy Kirkwood’s Mosquitoes? That’s pretty good! I have to be hyper-aware about what is going on in the room and store all my ideas and thoughts in case the director needs another opinion. However, if the cast come to me asking for insights I always reinforce what the director has said. Once we move into the theatre, all this information that I’ve been gathering can really be of use to help the director to stay one step ahead of everything that is going on. I used to worry that I was merely a ‘jack of all trades, master of none’ but I’m now seeing how valuable all the other skills I developed years ago are. I don’t have to leave my producing skills at the door, or my army skills, or my opening-a-cafe skills, or my time working on festivals. I can draw on all of it and be adaptable, and no matter how stressful a production can be I know I won’t ‘flip out’. That’s the great thing about my role with STC and CAAP, it’s challenging but I know I can sit steadily in it. It gives me an opportunity to test and develop my creative instincts as part of an ongoing conversation. What is it like being in the rehearsal room? It’s a dream come true, no question. Rehearsal rooms are fascinating places! And this is one of those times where everyone is so connected to the work - everyone is coming in with amazing observations and ideas, with great regard for each other’s characters and work. The energy is buoyant. In week one of rehearsals there were already beautiful relationships developing and such astonishing discoveries being made. You have painted a picture of a brave journey-woman who was willing to go anywhere to find a place to express her creativity. Do you feel you’ve arrived somewhere meaningful yet? Definitely. But strangely I feel as though the scope is getting broader because I’m free to breathe everything in rather than needing to narrow things down. With the support of STC and CAAP I have been able to invest in myself and learn to trust in my skills, to share them with others, and to give back – ASAP! Find out more about the 2018 CAAP Directors here. Seeing the show? Pick up a souvenir play program from Theatre Bars in the Western Foyer for $12, featuring in-depth articles, photographs and info about cast and creatives. You can pre-purchase program vouchers for $11 when booking your tickets. Season Ticket Holders can pre-purchase vouchers for $10 with their Season Ticket.